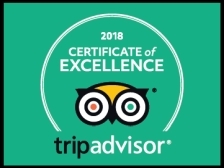 In 2018 Baraka was awarded a Certificate of Excellence by TripAdvisor for the tenth year in a row. In June 2003 it was awarded second place in the much-coveted competition for the preservation and maintenance of its historical buildings by the Ronda City Council. Baraka is an oasis in the old city. It is on a pedestrian cobblestone street and has been renovated adding contemporary comfort to its historic charm. It is ideally located for exploring the old city and its historic monuments. Within a couple of minutes' walk from the famous Puente Nuevo (the bridge) it is completely insulated from the hustle and bustle of the town. The only sounds breaking the silence are birdsong and church bells. Baraka is a perfect base for exploring the famous pueblos blancos (white villages) of Andalucia.